Know the time no matter where you are wearing the highly sophisticated Citizen Watches® Eco-Drive watch. 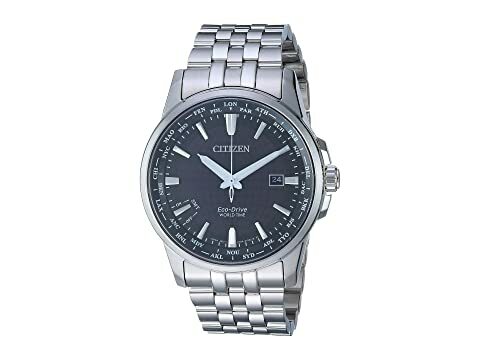 Round silver-tone stainless steel case. Silver-tone stainless steel five-link bracelet. fold-over clasp with push-button closure. Black luminous three-hand analog display with E784. caliber world time in 26 time zones, perpetual calendar chronograph, high-accuracy quartz movement, date display window, and brand name. Black dial face features stick index hour markers, minute track and abbreviated world locations at perimeter. Water-resistant up to 5 ATM /50 meters.